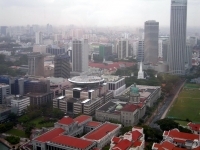 A view of downtown Singapore. I am a social worker from Singapore—a young one. My career in this field is barely five years old. Prior to my current work as a school guidance counselor, I have previously worked in community-based family services and mental health services. In Singapore, provisions of staffing for family and mental health services are largely government-funded. It is also a field that has been chronically understaffed. For a long time, it had also been widely acknowledged as a field that underpaid its staff due to financial constraints, but that has improved dramatically in the last few years. In Singapore, social workers and counselors work side-by-side, sometimes having similar job descriptions depending on the agency in which they are employed. Community-based services rarely have the privilege of a full-fledged psychologist on staff, even fewer get to work with multi-disciplinary teams of professionals. Research has been increasing in quantity in recent years, and while some have attempted to bring in Evidence-based Practice, it seems that this has not caught on very much yet. Perhaps because most services are funded by the government instead of insurance companies, practitioners here have not yet been restricted to running programs and using therapies that are only validated by research and scientific methods. The field is still largely helmed by social workers and counselors and still retains a deep humanistic flavor. While helping professionals here may not directly identify themselves as ”humanistic,” a quick check with them would reveal strengths-based orientations undergirded by a belief in the inherent dignity and worth of every individual. These are critical convictions for the field to retain, as opposed to a more diagnostic and pathological approach. Singapore is a small country—it takes 30 minutes to drive from one end of the country to the other. A world-class marathoner would be able to run across it in no more than two and a half hours. It is also young; gaining independence only as recently as 1965. Our resident population comprises descendants from immigrants who moved here from across Asia about 200 years ago in search of better lives. A large proportion of us are ethnic Chinese, the indigenous Malays, as well as Indians. As much a result of pragmatism and as of policy, the lingua franca is English, enabling us to communicate with one another and with the rest of the world. From the very beginning, Singapore’s small size and its lack of natural resources have contributed to an existential anxiety at the threat of non-being. We have always had our nation’s vulnerability and survivability drilled into our minds relentlessly, becoming somewhat our national narrative. In order to maximize the country’s chances of survival, our government embarked on 47 years of relentless nation- and economic-building. The government prides itself in being unapologetically pragmatic, distancing itself from any explicit political ideology, being relatively free of corruption and smooth, glitch-free execution of difficult policies in pursuit of economic growth. In the name of efficient use of limited resources, it does not shy away from employing cold, hard economic ideas in many areas of its governance as diverse as education or raising falling fertility rates. The relentless drive has brought about nothing short of an economic miracle. Economically-speaking, we have gone from Third World to First in two generations. Yet, in the past few years ,a myriad of issues—an aging population and an abysmal fertility rate, the State’s almost allergenic fear of any form of government-funded social welfare, a widening Gini coefficient and huge inflows of immigrant workers and expatriates—have prompted much reconsideration and pondering over the future of Singapore and its people. Against this backdrop, a video of a 40-year-old millionaire doctor’s final speech before dying went viral on social media here a while ago, even making it onto the front page of some smaller mainstream newspapers. In this piece of sharing, he told the story of how he made his million within a year of becoming an aesthetic physician and went on to amass riches most Singaporeans can only dream about. However, one day, he felt an acute pain in his back while in the gym, and was diagnosed with stage 4 terminal cancer with not more than six months to live. What followed can only be described as an existential awakening, in which he pursued meaning and relationships, and worked hard on rediscovering what mattered to him. This video and a transcribed text of his speech went viral in a couple of days. While his message had its fair share of bitter detractors, it was in fact very moving for many regardless of background or religious faith. Why so? I believe that this message spoke to the yearnings of many Singaporeans who, now having experienced relative wealth, come to find their need for more in their lives. Something deeper, convictions to hold on to and beliefs to be lived out. Dr. Richard Teo’s message awakened many whose own nagging discontent and dissatisfaction had lay dormant below the surface of their current material and comfortable lives. Back in August 2012, at the encouragement and partnership of Mark Yang, I started work on putting together a small institute in Singapore to promote Existential Psychology here. To be honest, I really am a nobody in the mental health field in Singapore. I am young and I have limited experience—I do not yet have advanced degrees in training for therapy. What I did have was attending a couple of workshops and conferences overseas, plus a lot of reading accumulated over the past three years when I first started to get interested in this particular area, and Mark’s encouragement. Despite this, I knew that existential thinking has had a deep impact on me as I read, digested and experienced first-hand for myself some of its ideas. These readings on existential ideas deepened my living and my experience of life, brought more joy as I accepted some of the struggles I experienced, and improved my relationships. I wished for these ideas to inform not just my own work, but the work of therapists, social workers, counselors, and mental health professionals. I wished for all of us to allow existential thought to expand our views of the human being, and in that process, enable us to better connect with those we work with. And hence, with much excitement and trembling, I took some of my own savings and started working on the Centre for Existence. We have since held our first workshops on Existential Psychology in Singapore and also hosted a movie screening as a platform to discuss existential themes. Many of those who attended shared that they were glad to find a platform to ask the important questions in life; and while not necessarily getting any answers, they found it immensely comforting to know that others too had asked the very same questions of themselves. We are currently planning for this year and look forward to many more exciting events. From the very outset, I have believed that Existential Psychology has the potential to impact people, lives and society beyond its own influence within the psychological circle. It is critical that the existential attitude and the humanistic beliefs underpin our approaches to our clients, but the early thinkers like Nietzsche and Kierkegaard never meant for their work to be applied only to clinical populations. Such is the beauty of the existential imperative: it affects us all deeply. If we allowed ourselves the space to reflect and the freedom to articulate our own human experience, it also means that each of us has much to contribute. It is in this spirit that I believe Existential Psychology in Singapore does not need to be confined to the therapy room. Among those who had gone before us, many helping professionals took their clinical wisdom and expanded upon it to speak to various facets of the human condition. Individuals like Salvador Minuchin spoke out about a new way of understanding families (particularly poor families), Virginia Satir gave us an easily accessible metaphor in her Iceberg model to understand a way of finding peace within and peace among, Martin Seligman’s work on Positive Psychology has impacted schools, hospitals, corporate organizations and businesses. In recent years, Brene Brown, a social worker and researcher, has taken her ideas about wholeheartedness and shame to a much wider audience through the TED conferences. Indeed, my wish for Existential Psychology in Singapore is that it would give helping professionals here a system of thought and vocabulary to clearly articulate what they believe about the human experience. In my experience, this belief is absolutely critical to any therapeutic work we seek to embark on. Beyond the consultation room, however, I hope that helping professionals would gain a more influential voice in speaking to the human condition; and indeed the Singaporean experience. For me, this means more than giving input on Governmental policies, advocating for services, or identifying gaps in the social safety net. Many social workers are outstanding at that kind of work. I see Existential Psychology’s greatest potential in its ability to confront aspects of the Singaporean human experience, and catalyze movements of introspection for Singaporeans to live more openly, mindfully, intentionally, and authentically. Singapore as a nation is on the brink of a collective existential crisis. We have always been so driven by our need to survive that few have stopped to ponder how and in what manner we want to survive as a nation. Many are getting richer, but the poor are getting poorer; Singaporeans are looking beyond their basic needs and are beginning to ponder the possibility of a life after materialism. Many are pondering meaning and relationships as an alternative wealth, philanthropy, and service as an alternative status symbol. The Existential Psychology I see for Singapore in the future is a tireless advocate for all of us to take a Pause and consider our ways of living. For Singapore, there is no better time to introduce the Existential. Singapore has much in common with our Asian neighbors by virtue of our heritage. Our ethnic Chinese still speak a decent level of Mandarin (though our Chinese friends from the Mainland are likely to disagree), our Malay and Indian counterparts often still have links across the Southeast Asian peninsula and the Indian subcontinent. We are one of the most mobile, educated, connected, and yet deeply religious societies across this part of the world. This combination of factors have allowed Singaporeans to become leaders and pioneers in many fields. Yet, in the field of mental health services and therapy, we have largely been followers of trends elsewhere in the world (most notably the U.S.) rather than being trendsetters. There have been many efforts to take Western therapy models and adapting them to Singapore in a culturally-sensitive way. In our short history characterized by the relentless emphasis on Sciences, Mathematics, and Economics, Singapore has seen few literary, theological, philosophical, or psychological giants emerge from its own. It remains to be seen whether our resident population of three million has an identity unique enough to allow an indigenous model of psychotherapy to emerge organically and speak uniquely to this population. Singapore has one of the most mobile, connected, and heterogeneous populations in Asia. This mobility is pervasive not just among the wealthiest, but even for the middle-class. One consequence is that we have a population of people from every continent, making the Singapore identity hard to pin down and define. As mental health professionals, one in two clients we see is likely to be from another country. Because of this, perhaps a more useful route for Existential Psychology in Singapore is to develop partnerships and networks with experts in Existential Psychology in the region and around the world. Existential Psychology is burgeoning in Asia, through the work of Dr Mark Yang and Wang Xuefu in China, and others in Greater China, such as Rob Bageant in Taiwan. Interest in this field is also gathering pace not just in Singapore but also in our neighboring country Malaysia, with which we share many historical ties. It is my wish that by plugging into what the others are doing, thinking, and developing, Singapore can develop its own unique contribution to the thinking in this field distilled through our experience and identity. I am Singaporean, and I am an Existentialist. I love this country and its people, and I believe at no other juncture in our history have we collectively come to ponder the existential facets of life as we are now. There exists a great potential for Existential Psychology to impact not just our helping professionals, but our society as a whole. There exists more potential for authenticity, for intentionality, mindfulness, and appreciation right here on this small sunny island.